Are you experiencing a creative drought? Or are you bursting with creative ideas for social campaigns, but stumped about ways to validate these ideas? Here are 25 ways you can come up with more creative social campaigns to achieve your business goals. Listening to your friends comes naturally. You want to hear what they have to say, and it’s easy: they’re sitting across the table from you at brunch, or you’re texting up a storm, back and forth. Because you are involved in this seamless interchange of information, and listening intently, you know as much about many of your friends as you do about yourself. The same is not true of your relationship with your social audience. With our social audiences, we tend to push out information (owned content) and measure the effect of that content. Sometimes we forget to begin by listening to our audiences and building content around what they actually care about. We end up pushing out content that just isn’t quite right. It’s like your friend telling you about a Golden Retriever puppy she wants to adopt and asking for your advice, and you responding by listing out your favorite qualities of Labradoodles. Tangentially related, but not quite right. We marketers fall into this trap an awful lot. Here’s how you can begin to shift your thinking. Building empathy happens when you pay attention and listen deeply. This tends to come naturally in friendships: if your friend is hurting, you’re hurting. You wouldn’t scroll through your Instagram feed while your friend shared the painful news of his divorce, would you? The same concept can be applied to your relationship with your customers and/or social audience. Don’t busy yourself so much with your owned content (what your brand has to say) that you miss out on what your audience is saying and feeling on social, forums, and blogs. By building a solid foundation of empathy for your audience’s wants and needs–and how those wants and needs evolve throughout the customer journey–you’re also building better content, responses, and, ultimately, sentiment around your brand. One reason you’re able to so easily understand your closest friends is that you have a shared history. You’ve heard the story about Johnny chipping his tooth on a parmesan rind back in college a million times. You were there when Linda got to party with Snoop Dogg on her bachelorette trip. The same level of historical knowledge is important when it comes to your customers. When has your brand experienced the greatest spikes in reach, engagement, and volume? Which tactics and channels have historically worked for you (or your competition), and which have been misses? This is another common mistake for marketers: we commit to a campaign, regard it as a success or failure, and then move on too quickly to learn and document valuable lessons that can help us do better in the future. Don’t fall into this trap! Continue adding to your (separate) lists of customer knowledge and self-knowledge regularly as time passes and the data keeps rolling in. You and your best friend have an endless assortment of inside jokes and maybe even made-up words and phrases that only you two understand. It’s kind of annoying, TBH. But shared experience = shared language. The same equation is true for listening to your customers on social. If you understand the slang and solutions that your audience throws at one another without you hovering in the room, you’ll eventually be able to learn their language and use it to better reach them. The best conversations with your friends happen after a glass of wine or two, when you go deep into your fears and hopes and vulnerabilities. Don’t miss out on the most important, indepth information about your customers by staying on the surface. Take the time to look at the most buzz-generating comments around your brand and/or industry on social at least once a day. This will give you the level of depth you need to move forward and make better choices. Take a marketer you know and admire out to lunch, or approach him or her on social and ask for a quick chat. Come prepared with a set of questions, as specific as possible. We recommend choosing a particular campaign you were floored by, and digging deep to find out what you can learn for your own brand. We have some social media experts on our staff who are always happy to talk about how Sprout Social’s full suite of social media tools can help you leverage data to come up with new campaign ideas. Want to learn how Sprout Social's social media management tools can help you excel with social marketing? Fill out this form and our team will be in touch! If you’re not in a position where you can talk to your customers directly, try and schedule some time with your customer success team. These are the folks who have consistent conversations with your audience and can tell you exactly what pain-points they’re looking to solve. Then you can create custom social media campaigns catered to those specific challenges. Doing your research on how marketing executives (including your own!) think and operate is essential. Read interviews with CMO’s from best-in-class brands, and pay attention to the initiatives being emphasized on a broader level at your company. The strategies and messaging set at a high level always impact what marching orders are departmentally–if not now, next quarter. Understand bold, innovative visions and you’ll be able to come up with and execute creative campaigns that accomplish business goals in your organization. Some of the best creative ideas you’ll find for social media campaigns come from outside business. Here are some of our favorite quotes from thinkers who focus on expanding creativity and self-improvement. We recommend reading these books when your well has run dry. Being able to pivot quickly according to data findings is important. No one believes this more than us. But abandoning a campaign or messaging angle or visual approach because the data doesn’t match your ambitious goals within the first week or month is not the smart way to go, because it doesn’t give your message enough time to saturate the market, if it is going to saturate the market. By pivoting too quickly, you risk diluting your brand story and recognition with too many different messages within too short a time span. This confuses your audience, and ultimately gives your competitors an advantage. We recommend making no campaign less than three months long, and breaking your campaign plan into multiple phases. At the end of each phase should be a stopping point at which you formally evaluate the data, and come up with an action plan for modifying your plan accordingly. “A set of research results indicating that listening to Mozart‘s music may induce a short-term improvement on the performance of certain kinds of mental tasks known as “spatial-temporal reasoning”. So try and listen to some music while working on your social campaigns! Use Spotify to create a playlist that goes along with your campaign, and encourage followers to share the playlist on social for a chance to win a prize. Do your social and content teams work closely enough together, or do you run on parallel tracks that rarely intersect? If the latter is true, you’re missing out. When your content team is regularly informed about what’s performing well (or not) on social, they can create better content for your social team. When your social team is regularly updated about which content requires promotion to fit brand messaging, product offerings, and larger marketing initiatives, they can be more strategic about how they post. Magic can really happen in this intersection. Once you have a clear campaign theme and message that your entire marketing team is driving toward, your email marketing team begins planning sends. 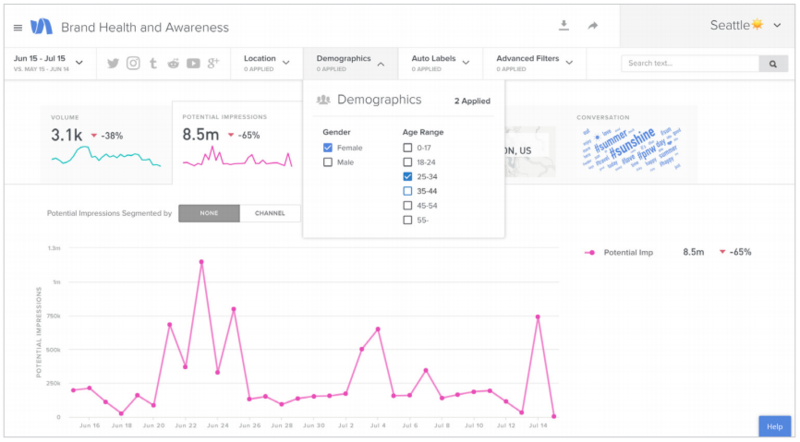 Make sure you’re aligned on these sends so you can figure out how to best support the larger campaign by driving web visits and content downloads. If you’re not involved in these meetings now, you should push to be. Previously unexplored collaboration opportunities can make great ideas happen. What you do on social plays a role at every point in the buyer’s journey – all the way from awareness to decision. Own that power fully this year, and fill the gap between awareness and decision. Optimize your content production based on what consumers organically signal to be most compelling through complete understanding of how consumers share your content privately (dark social), leading to conversion and what other relevant topics your target audience talks about most. Optimize your content distribution through social channels for full-funnel impact from impressions, to engagement, to visits, to conversions, based on how content performs through posts published by your owned brand social channels. Learn from competitors’ content strategies by analyzing how their audiences engage with competing brand content on social, so you can target these audiences with relevant messages and compelling offers. Looking into what campaigns have a tangible impact on your bottom line may help you discover campaigns that will drive amazing results. What is the average engagement per day for the brand you see as your competition? How often is their owned hashtag being used on a weekly basis? 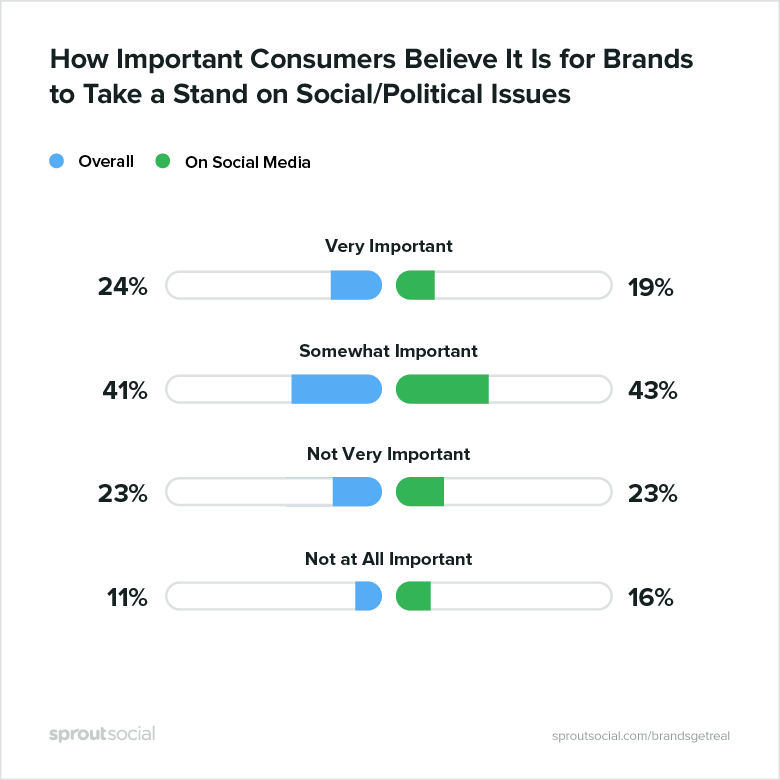 What does a successful campaign look like for your primary competitor, in terms of engagement, follower growth, and connection depth (i.e., comments and conversation vs. a simple Like)? Remember that the brands you benchmark against don’t necessarily have to be competitors for dollars in the bank, or even within your industry: they can be competitors for a certain brand voice or visual association you are trying to foster with your target audience. Your target audience only has so many hours in the day to interact with brands on their social feeds; you want to make sure your brand is front and center, and, if it’s not, understand why. If this is a new concept to you, check out our guide on running a competitive analysis on social media! I’m talking Snapchat and Instagram Stories here, people. Snapchat recently finished up 44% on its first day as a publicly traded stock. There’s a reason for that. These platforms give you creative freedom as a brand, and a chance to infuse your brand with personality in the public eye, increasing brand advocacy and conversions. Invest time and resources in Instagram Stories (which can be great conversion points from Instagram), Snapchat, and/or Facebook Live. Do your research on brands incorporating these platforms in their campaigns already, and you’ll find inspiration. The quickest place to start is by looking at the influential folks who are already engaging with your content and talking about your brand. 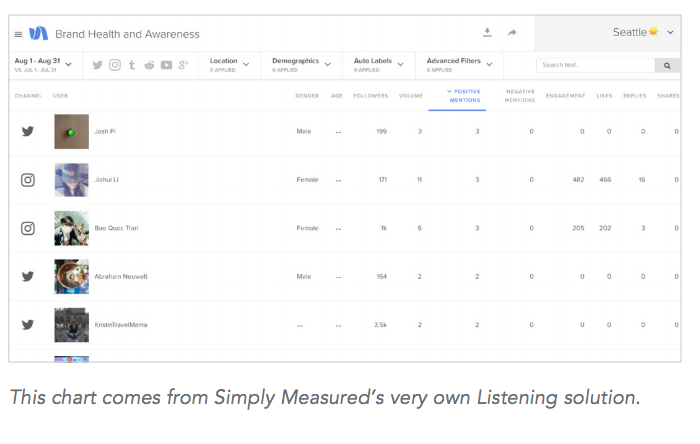 Simply Measured’s Twitter Account Report surfaces the users who’ve engaged with your brand the most regularly, and users who’ve engaged with your brand that have the most followers. 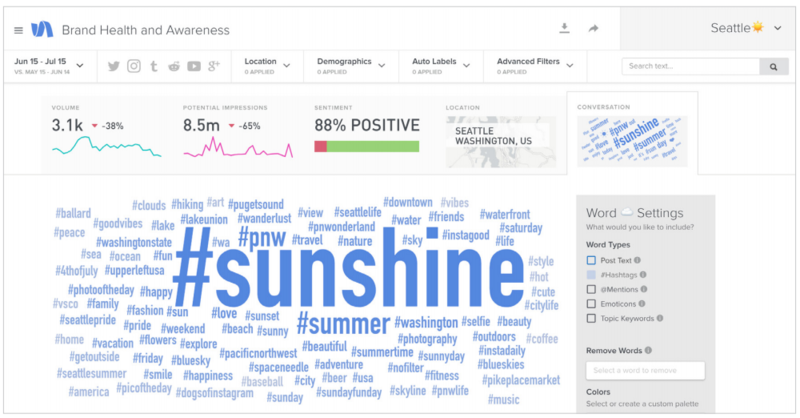 In this Instagram Hashtag report, you can quickly see the users who are posting the most often with your hashtag, the most-followed users, and those who are generating the most engagement with their posts that use your hashtag. This is a great opportunity to identify folks that are already your brand influencers. This mantra pushes us to validate assumptions by listening to actual humans. This is good advice for anyone looking to identify influencers on social media. Don’t just look for the folks who are tagging your brand in every post and already engaging with all of your content (although, as I mentioned above, you may find some valid opportunities there as well). Look for folks who are driving value in conversations that are relevant to your brand, but not ones that necessarily involve your brand. 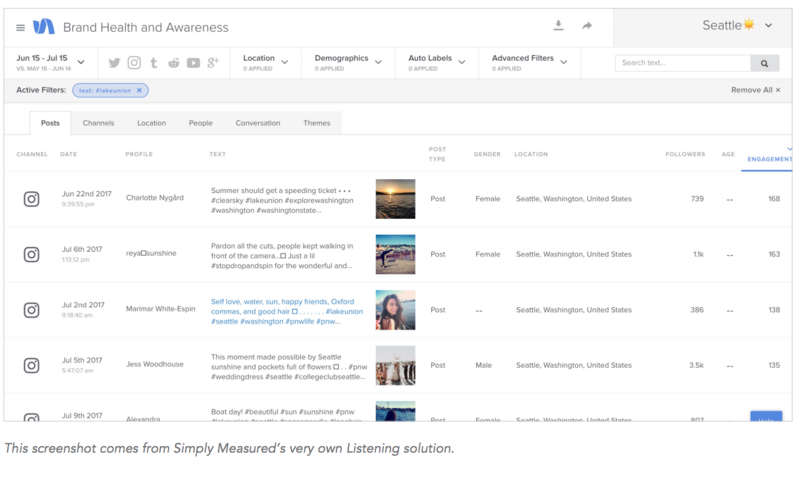 With Simply Measured’s Social Listening, discover the most influential and engaged people discussing any topic of your choosing. British Airways recently did this with panache. Their #Unforgettable campaign, devised by Ogilvy & Mather, recruited a father and son after they wrote a review thanking British Airways for their New York trip. The centerpiece of the campaign was a video, which was complemented by a social media competition inviting people to share their #unforgettable holiday moments, geniusly soliciting UGC from a content piece with its roots in UGC. Co-marketing is a great way to expand your awareness with people likely to buy your product. 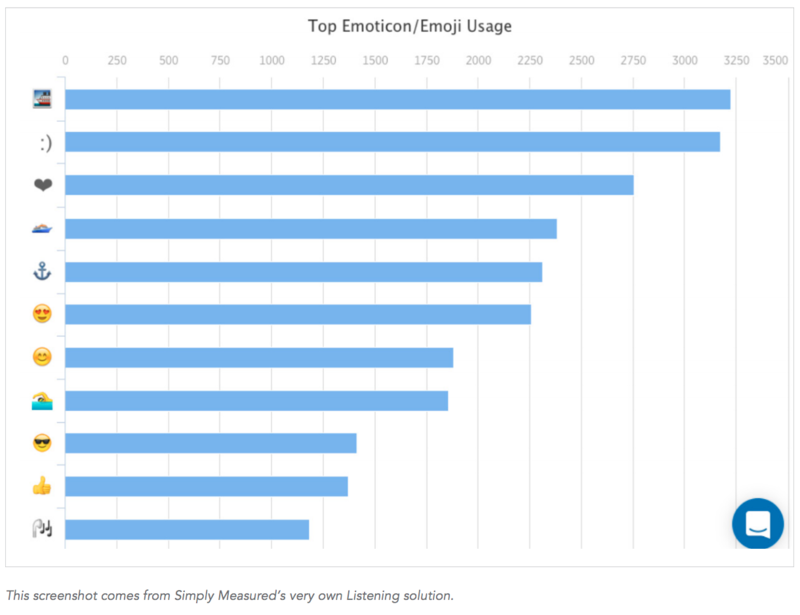 These should be two different tracks in your social media marketing strategy. On the one hand, you’re trying to keep and engage with the customers you already have. On the other hand, you want to, obviously, acquire more customers, AKA ROI, with your social strategy. Some content might appeal to both customers and non-customers, but you should also be creating unique strategies to target each of these categories. In your content calendar, make sure you should have posts and mini-campaigns devoted to each of these categories. This applies if your brand targets young folks, has a brick-and-mortar presence, a pop-up shop, and/or is sponsoring a booth at a conference. A recent study by Accenture examines the attitudes and expectations of 18- to 20-yearold Gen Z consumers–those already with spending power–along the path to purchase and compares them to Millennials. The study is based on a survey of nearly 10,000 consumers across 13 countries, including 750 U.S. consumers. While Gen Z is a very much a “digital native” group, 77% still prefer to purchase in-store. 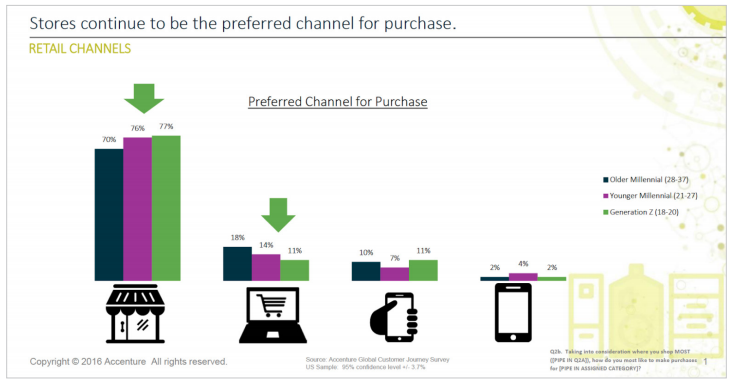 In addition, 44% will go to a store to get more information before making an online purchase. Here’s the takeaway: inspire and generate awareness on social, and make sure your brick-andmortar presence echoes the messaging people have consumed there to close the deal. 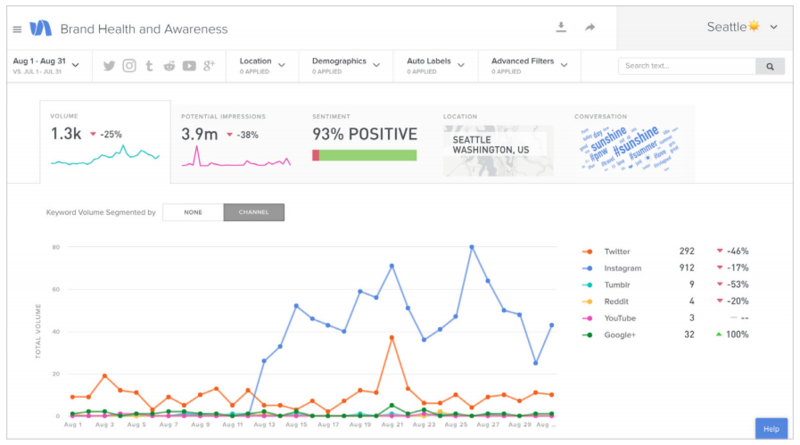 For awareness-generating campaigns, your social strategy doesn’t have to be as micro-focused on your value prop and brand as you think. Once you know who your audience is on social, you can build campaigns which appeal to other aspects of their lives and perspectives. For instance, you might be a hotel chain hyper-focused on medium-budget travelers between the ages of 21-30. You could create a whole campaign around budgeting for travel. The most important thing to remember here is that you need to provide value that is totally unrelated to closing a deal: this is an engagement-generating campaign to push people further down the path to purchase, not get them to book with you immediately. With a campaign of this nature, if people feel they are being blatantly sold to, they will automatically distrust the content you’re surfacing. There are countless studies and stats being released about how social media affects the human brain, and how different demographics engage on social. Read ‘em! These studies give you insight into how people interact with social in general and, ultimately, your brand. Chances are, the words and terms you want to rank for as a brand on Google are the same that you want to be associated with on social. Contact your SEO friend in your organization to find out which words and terms you are focused on, and weave these into your social media campaigns. This is especially important as Tweets are now included in Google search results for certain words and terms. And create follow-up content to make the most of your efforts there. This follow-up content should direct people towards your blog and/or website. Don’t jump on the #Oscars2017 hashtag if you’re a B2B analytics company. With such a buzz-generating, business-irrelevant event, you’re not going to reap any tangible rewards for your business. The customer journey is your new marketing funnel. The social media marketer’s job is to move people through the customer journey via social media sharing: from awareness, to consideration, to purchase, to the loyalty and advocacy stages. Make sure you know how your content is being shared across this journey, and across all your active social channels. If you’re sitting at your desk, truly in a creative rut, go take a walk, a run, or a yoga class. Shake it out. Then keep mulling our tips over and put together your Best. Campaign. Ever.